Last year I shared with y’all my DIY Christmas presents of Protein Smoothie Kits and Christmas bark in DIY Comes Once a Year. This year, I stuck with the same theme but changed it up a bit. 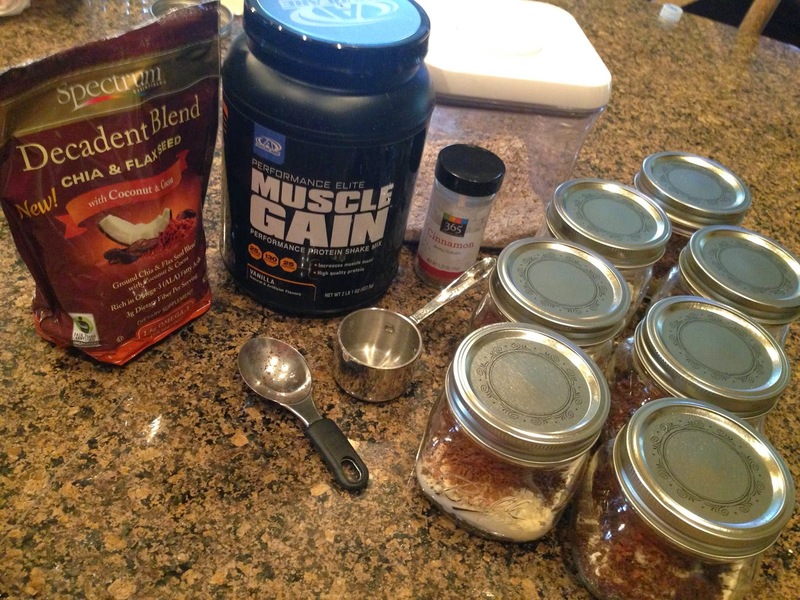 One of my favorite go-to breakfasts is Overnight Proats aka: Protein Oats. They’re simple, packed with protein, gluten free, and just enough carbs to fuel you through a workout or a busy morning at the office. Most days I eat them cold when I’m on-the-go, but I really prefer them warm at home with a cup of coffee in bed while I write. 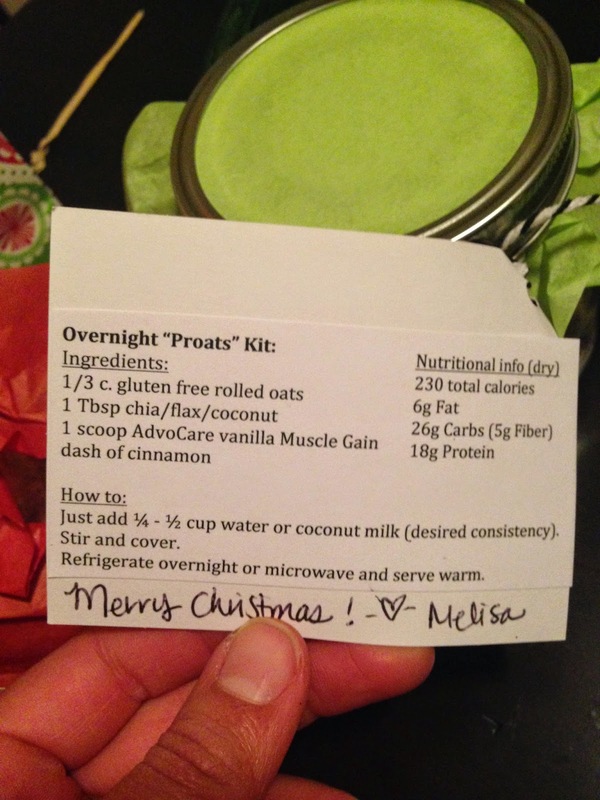 🙂 Because Proats are a few of my favorite things; I decided to share the gift this season with my bootcamp and personal training clients. 1. Wash out new jars with soap and water and dry well. 3. 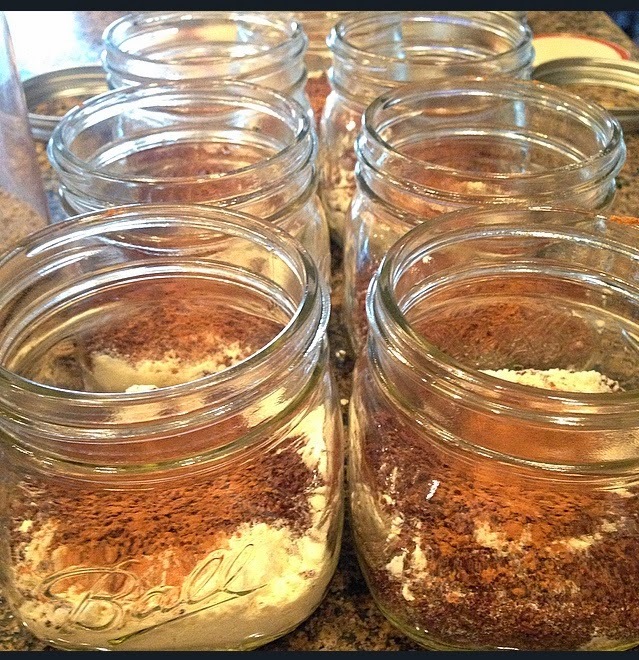 Place lid on jars. 4. Cut square of colored tissue paper to cover silver lid, screw the lid closed. 5. 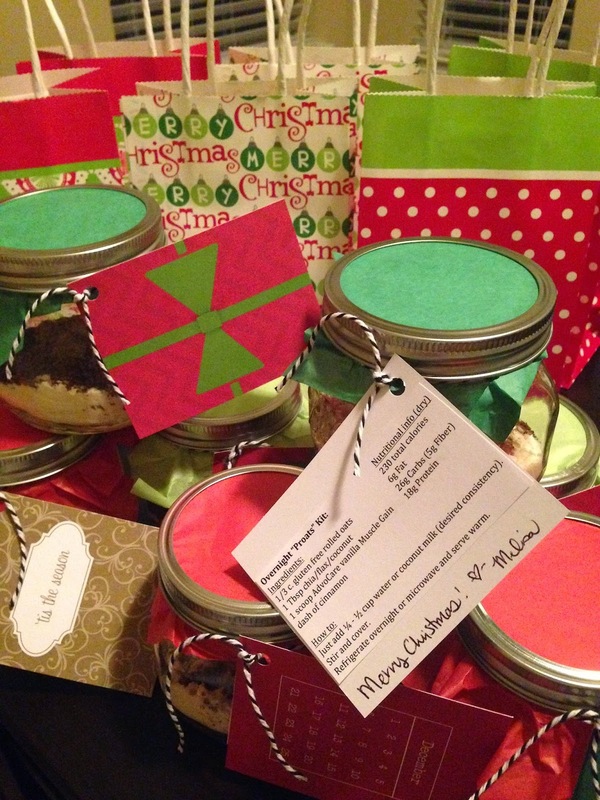 Tie ribbon around top of the jar and add ingredient list and/or gift tag. 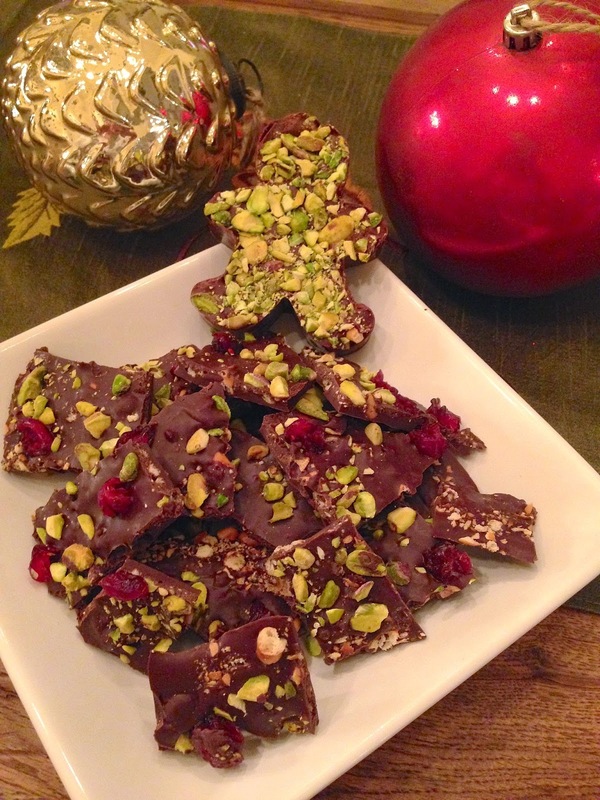 And because everyone loves chocolate, I also made Christmas Bark again this year. This time I tried something new inspired by Your Homebased Mom blog: Peanut Butter Pretzel Bark with a few modifications. The original recipe can be found here. 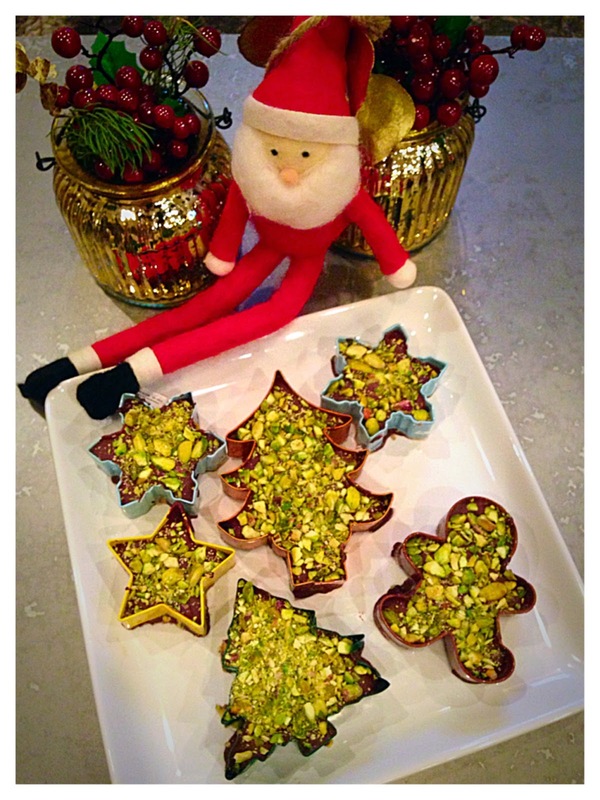 This recipe can be made into Christmas shapes or just into traditional bark squares. The fun part is giving the cookie cutter as part of the gift as well. Coat a 9X12 inch rimmed baking pan with cooking spray and line with a sheet of wax paper. If using cookie cutters, coat the inside of each cookie cutter with cooking spray and place them on a tray lined with a sheet of wax paper. Melt the semi-sweet chocolate chips – according to the package directions – using a microwave or double broiler method. Pour into the baking sheet, or divide among the cookie cutters, and spread even. Sprinkle with the crushed pretzels. Combine the dark chocolate chips with the peanut butter and melt – according to the package directions – using a microwave or double broiler method. Pour the chocolate peanut butter mixture over the semi sweet chocolate and top with the crushed nuts. Refrigerate for 30 – 45 minutes, until firm. For more DIY gift ideas I love these candied nuts from Elana’s Pantry; super simple and a pretty presentation. I hope you all have a wonderful Christmas filled with quality family time, lots of love, lots of giving, lots of hugs, lots of kissing, and lots of laughter. Stay tuned for my next post on what’s coming for the new year! Are you part of the Tell Me Mel Community? If not, what are you waiting for? Sign up HERE!